Today we focus on risk management in the airline industry. 2007-09-09 – Sunday – an SAS, turboprop (Bombardier Q400) carrying 73 people caught fire after its right landing gear collapsed during an emergency landing at Aalborg’s airport in western Denmark. The plane skidded off the runway and five people were hurt during the evacuation. Wednesday SAS pilots attempted to land another 80-passenger Bombardier Q400 turboprop at Vilnius airport on its front and left landing gear, when the right set of wheels failed to extend. Passengers were ordered to move to the left side of the plane, as it approached the runway, for fear that the right propeller might shred upon landing and send shards through the right side of the cabin, according to the Lithuanian Civil Aviation Administration. 2007-09-12Wednesday SAS Scandinavia Airlines grounded its entire fleet of 27 Bombardier Q400 Dash 8 turtoprop aircraft following the above two incidents. 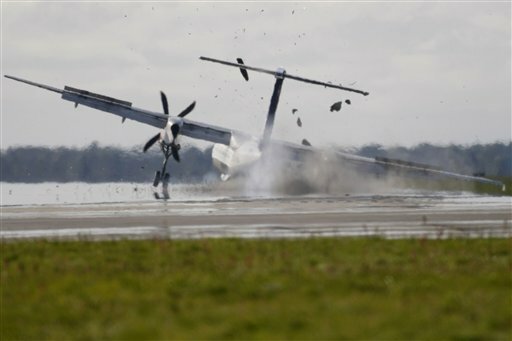 This move came after Canada’s Bombardier (world’s 3rd largest maker of commercial aricraft) recommended that all operators of older Q 400 – those that had accumulated more than 10,000 take-off and landing cycles – should ground the aircraft until they could be inspected. 2) take the risk and continue having the plane in the air. How could this decision affect SAS’ reputation (e.g., safety)?What might the legal consequences be – criminal and/or civil law suits? For instance, those planes landing at London City Airport (LCY) have Menasco retractable tricycle-type landing gear; each unit has twin wheels fitted with Goodrich anti-skid brakes. The two independent hydraulic systems are supplied by Parker Bertea Aerospace. This is the same landing gear as used by the 2 planes that crashed in Aalborg and Vilnius. To make it more convenient for you to take advantage of CyTRAP Labs’ offerings, just provide us with your e-mail address below. You can personalize your subscription to make it suit your needs.